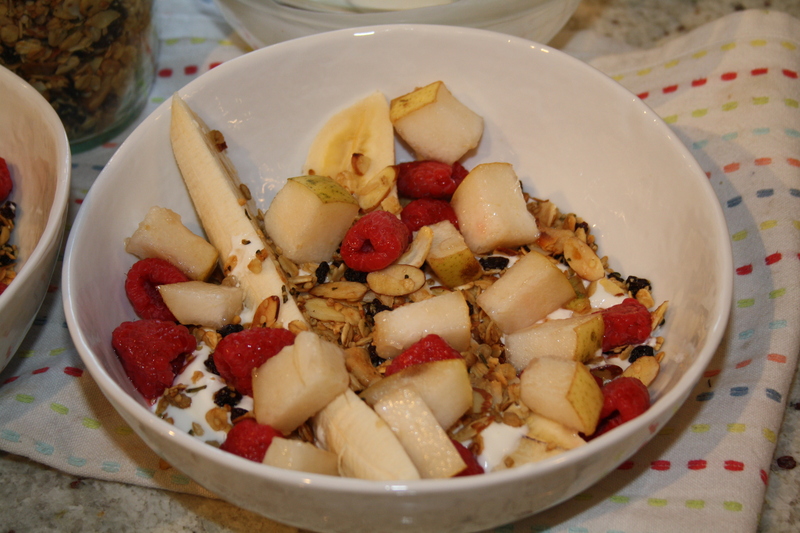 Along the theme of most culinary experiences in my life, I grew up eating breakfast banana splits. I think my Dad made them up – did you, Dad? – although a quick Google search tells me there are many versions and ways to interpret this dish. This was the ’90s so I feel confident in my declaration that Dad made them up one day. You can use store-bought granola if you wish. 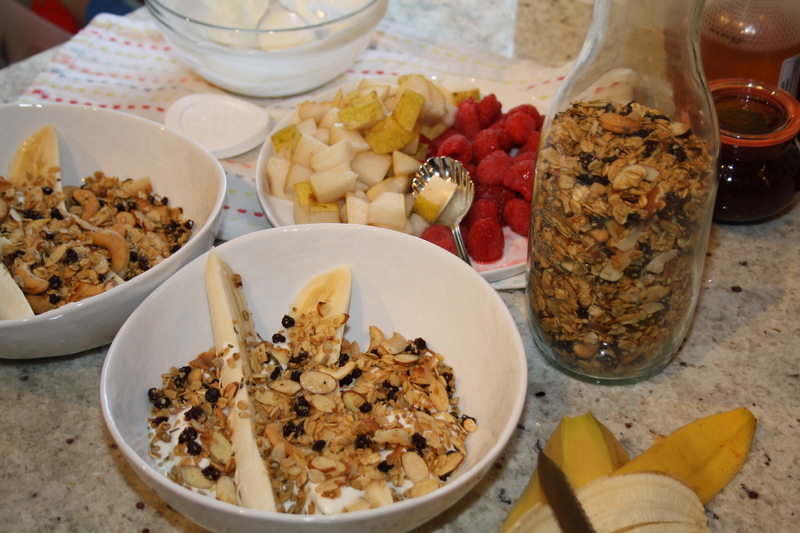 The thing is, granola is sooo easy to make. Really! You just dump everything in a bowl, give it a stir, bake it and you’re done. Granola is so super flexible too. Any granola ingredient, those in this recipe included, can be easily swapped out based on taste or what you have in the pantry. Here, I use currants, but you could use raisins, cranberries, cherries, or another dried fruit. Same goes with the nuts. I used slivered almonds and cashews, but walnuts or pecans would be wonderful. I had hemp hearts and flex seeds in my cupboard, so those went in. I love, love coconut so had to include coconut chips as well. Coconut flakes would sub fine, or you can omit them altogether. This is more of a savoury granola, hence the rosemary. I think the play between the earthy rosemary, hint of sweetness, nuts, and coconut is ridiculously good. I first tried rosemary granola when I was in Portland this Fall. I have a history of liking rosemary in traditionally sweet treats (rosemary scones, anyone? 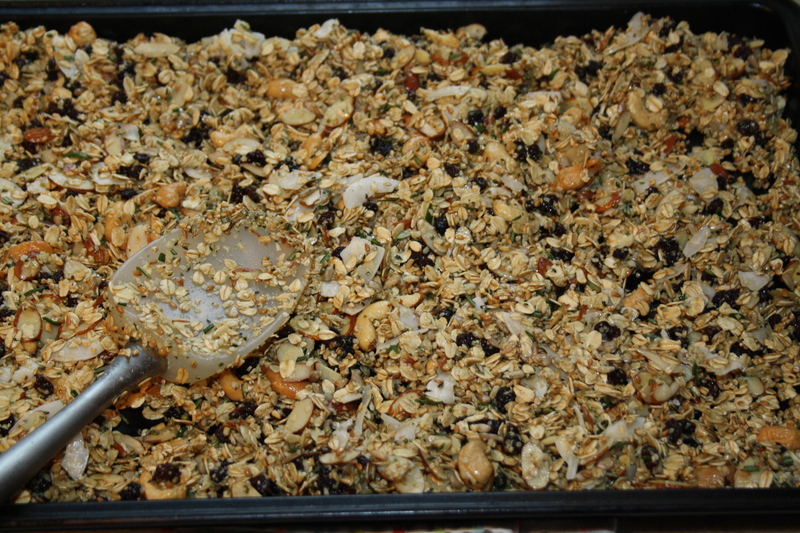 ), so it should surprise no one that I liked this granola so much. I had to make it for myself. Chopping the rosemary is important. You want the oils from the herb to start to mix with the other ingredients and come together as one. As you’re stirring the not-yet-baked mixture, adjust the oil/syrup/agave as you go until it reaches a texture you’re happy with. You want it to lightly stick together, but not clump. I could totally see how someone would want this granola to be a touch sweeter than the recipe below, so adding more syrup or more agave would work well. When I was a girl, breakfast banana splits were probably a really good way to get me to eat something healthy for breakfast. I can actually remember begging my Dad to make me one for breakfast when I was small. They are that good, that filling, and really nutritious. I always felt like I was eating dessert for breakfast. 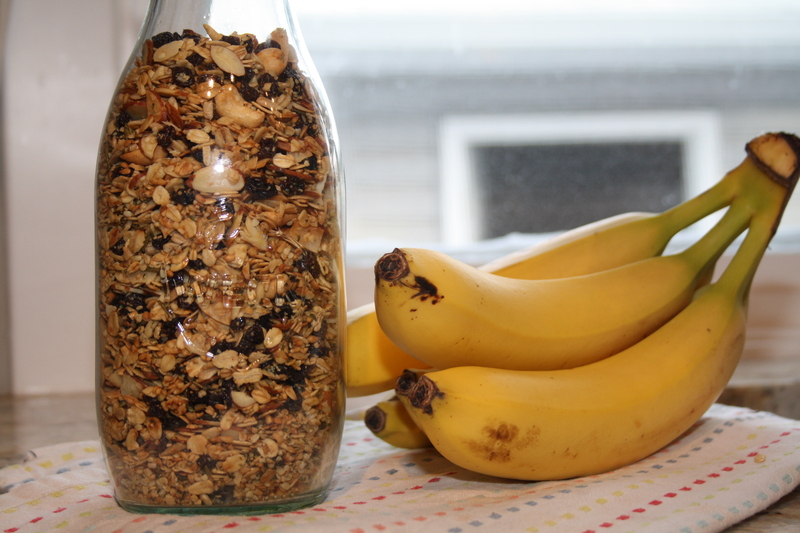 What you’ll need for sure are some bananas, granola, fruit, and yoghurt. It really doesn’t matter what fruit or kind of yoghurt you use. I’m pretty sure we always had vanilla yoghurt when I was growing up, but now Marcus and I prefer plain Greek yoghurt. The amount of yoghurt that man eats is insane, and we always have several tubs and flavours going on in the fridge. If you use plain yoghurt too, you might want to add a drizzle of honey or jam to the finished product. Or, you may like it just as it is. I opted for a pear and some raspberries to go into our splits. Use what you have around the kitchen. One split easily filled Marcus up (he’s more of a seconds and thirds kind of guy), so plan on one per person if you have guests joining you for brunch. Granola is easy, sweet and salty, and I dare you not to snack on it until it’s gone. The splits are fast and yummy, and versatile so you don’t get bored. We like bringing these to work for a nice breakfast too, just bring the granola in a separate container to avoid it getting soggy. Because, let’s be honest, dessert for breakfast always sounds like a good idea. 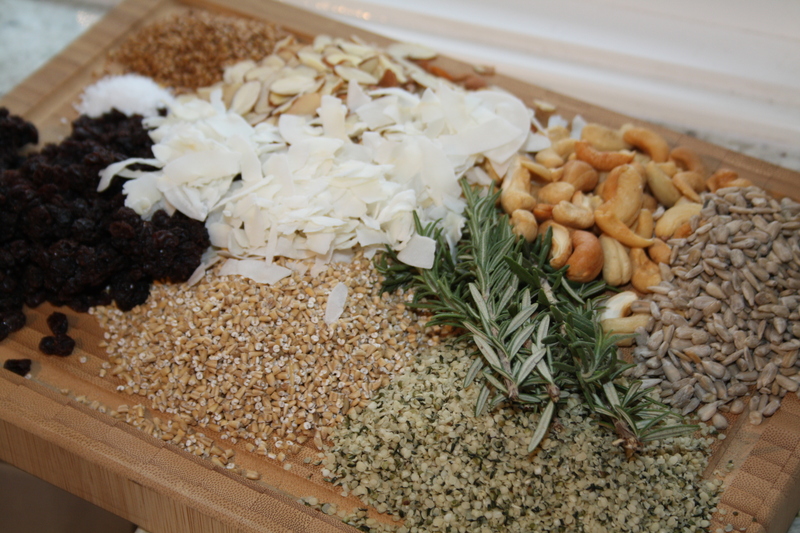 In a large bowl, stir together the oats, hemp, nuts, coconut, seeds, currants, rosemary, and salt. In a small dish, mix together the olive oil and maple syrup, then add to the oat mixture. Give it a good stir until all of the oats, nuts, and good stuff are coated. Have a little taste and add a drizzle of agave or more maple syrup if you’d like it to be sweeter. Spread on to a baking sheet and bake for about 35 minutes. 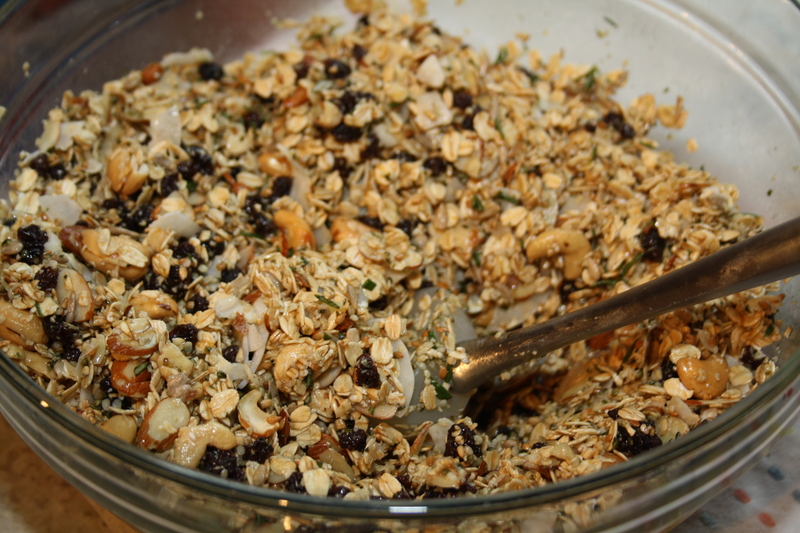 Near the end of the cooking time, give it a good stir to ensure nothing is burning and the granola cooks evenly. If you start to smell the nuts and coconut toasting before the 35 minutes, it’s done and you should pull it out of the oven sooner. Let cool on the baking sheet, then store in an airtight container. 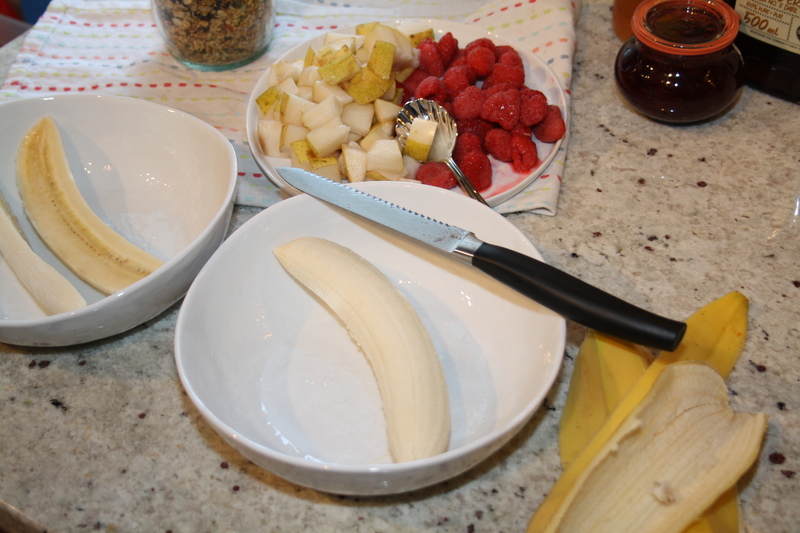 Slice your bananas lengthwise and place in a wide bowl. 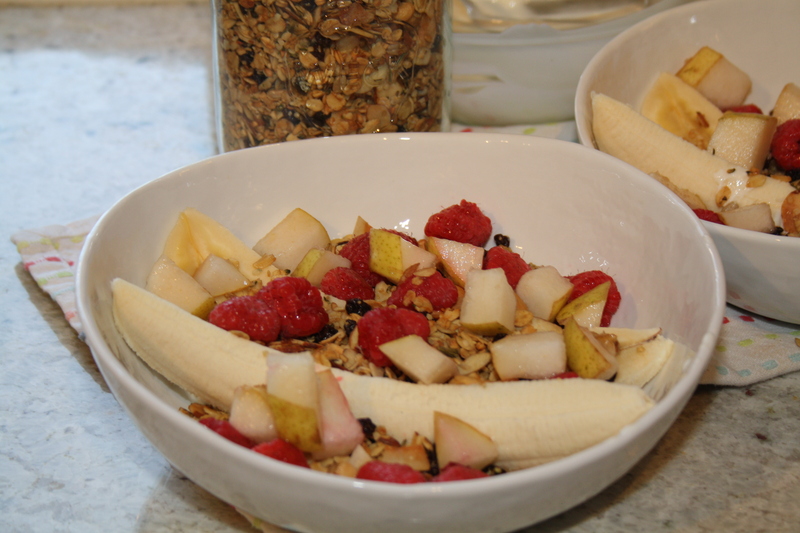 Spoon the yoghurt around the bananas, then sprinkle your granola. Add the fruit, and finally garnish with the syrup, honey, or jam if that’s what you’re into. Dig in! 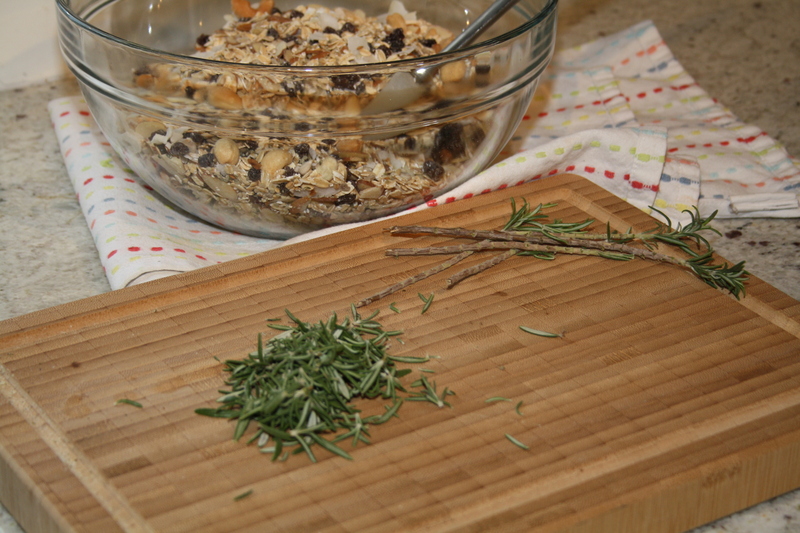 Mmm can’t wait to try granola with rosemary…sounds delicious!